Adobe's Photoshop Express, its free, online version of Photoshop is live right now. Targeted at everyday consumers, it's Photoshop stripped down to a pretty slick Flash 9-powered web app we got a demo of earlier today. It's super easy to crop, adjust saturation or exposure, or perform several other simple, but solid photo tweaks, like pop color (pictured). You won't be doing any heavy lifting with it, since you can't work with layers, add text or do anything really awesome, like amazing Giz-style comic bubbles, but your mom will be able to make her pictures look better than ever. You get 2GB of free storage in a quasi-Flickr setup, and it syncs up with Facebook, MySpace and Picasa—it pulls straight from your albums, and any saved changes show right up. Flickr syncing will happen in a couple of weeks. Photoshop® Express public beta, a free Rich Internet Application (RIA) available to anyone who wants to store, sort and show off digital photos with eye-catching effects. During the public beta period, Adobe will solicit Photoshop Express user feedback on product features and functionality, which will continue to evolve over time. As the newest addition to the Photoshop family line, Photoshop Express has taken much of Adobe's best image editing technology and made it simple and accessible to a new online audience. Photoshop Express allows users to store up to 2 gigabytes of images online for free, make edits to their photos, and share them online in creative ways, including downloading and uploading photos from popular social networking sites like Facebook. "Photoshop is trusted technology that has changed the visual landscape of our world. 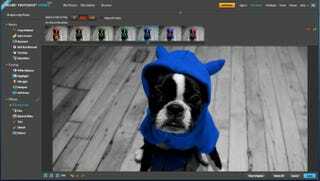 Now, Photoshop Express allows anyone who snaps a digital photo to easily achieve the high-impact results for which Adobe is known," said Doug Mack, vice president of Consumer and Hosted Solutions at Adobe. "Photoshop Express is a convenient, single destination where you can store, edit and share photos whether you're at home, school or on the road." approach, Photoshop Express offers tricks like Pop Color which selects an object in an image, mutes the background color of the photo and allows the user to swap the object's color so it jumps off the page. Sketch effects help photos look like drawings and the Distort feature allows you to distort facial features or objects within the images for a comical or artistic effect. Even users with limited photo editing knowledge can simply select what looks best from a line-up of sample photos with visual hints showing different variations of the added effect. animation that makes photos float and fly across the screen, allowing for viewer interactivity and unique presentation styles. Photoshop Express is the latest step Adobe is taking to leverage the advanced technology that underpins its awardwinning creative products and deliver it to new online communities. In early 2007, Adobe also announced the availability of Adobe® Premiere® Express, an online video editing and mash-up tool on partner sites such as MTV and Photobucket. Adobe Premiere Express leverages the functionality found in Premiere Elements, a fully-featured desktop video editing program. Adobe Photoshop Express beta is available now for free via any Web browser at http://www.photoshop.com/express. Photoshop Express was created with Flex, Adobe's free, open source framework for building RIAs. Flex applications provide a consistent, rich user experience across operating systems and all major browsers, including Firefox, Internet Explorer, Safari and others. An Internet connection and an up-to-date Flash® Player 9 are all that are required to experience Adobe Photoshop Express. In its early phases, Photoshop Express is available to US residents-only in English.